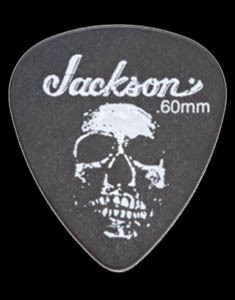 The guys at the Jackson Custom shop know a thing or two about what it takes to make a guitar that packs as much brutal tone as it does undeniable style. 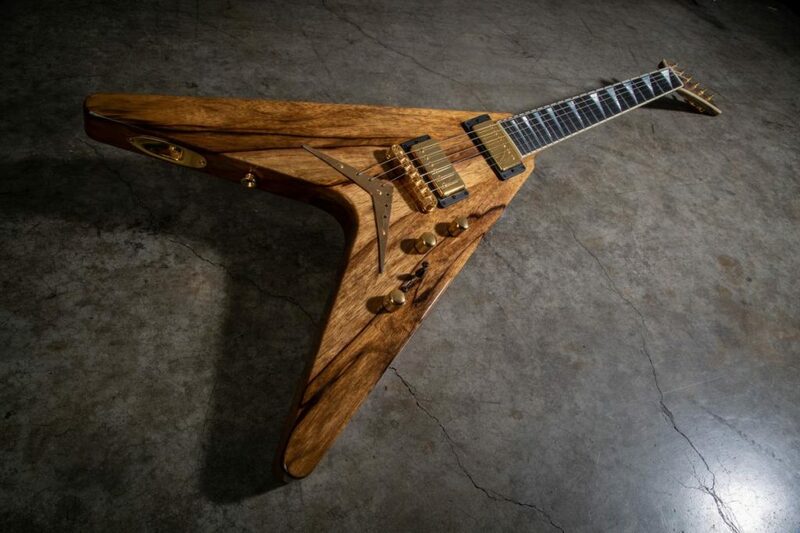 Set your sights on these 14 unparalleled custom creations that were revealed during the Custom Shop event at the 2019 NAMM Show. 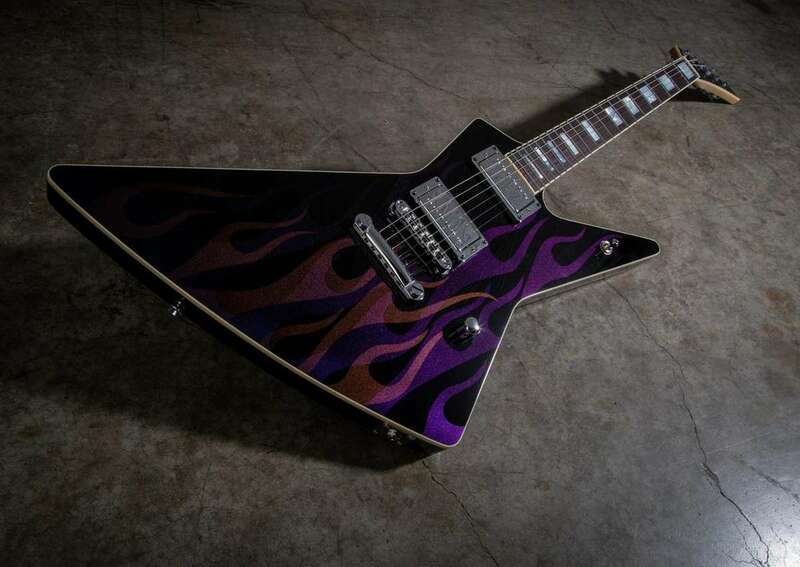 At first glance, you might get so caught up in the fiercely angular shape of this bad boy that you assume it’s just another black Jackson “metal guitar.” Oh, but so much more awaits as you turn it so that it hits the light just right so that pink and violet ghost flames appear. Senior Master Builder Mike Shannon and his son Travis teamed up for this 1-2 flip/flop punch with Mike building this Dinky XP and Travis handling the wicked paint job. 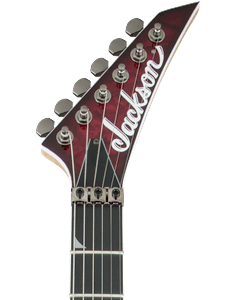 The Jackson headstock logo features a peach-pink-violet gradient to match the hidden graphic on the body, which is crafted from mahogany and paired with a through-body maple neck. 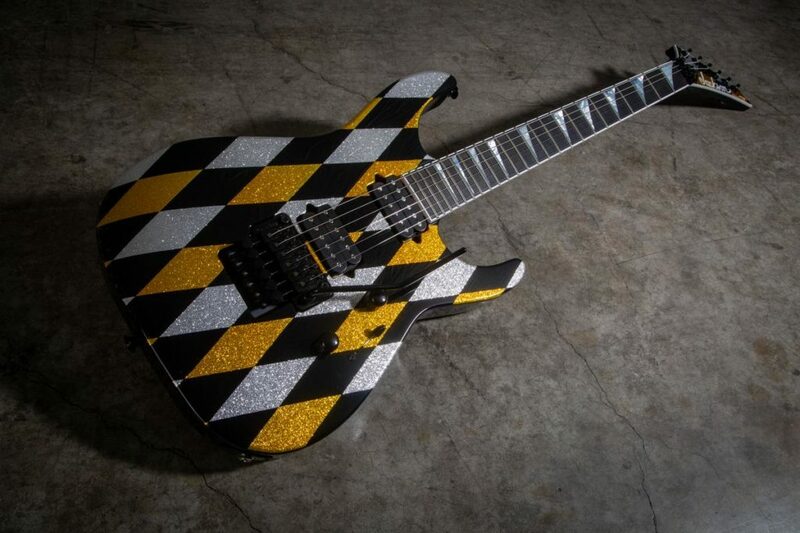 Cream body binding, compound radius rosewood fingerboard, pearl block inlays, EVH Wolfgang pickups, TonePros® bridge and chrome hardware complete this battle-ready axe. Metallic Silver and Black Crackle? Hell frickin’ yeah! 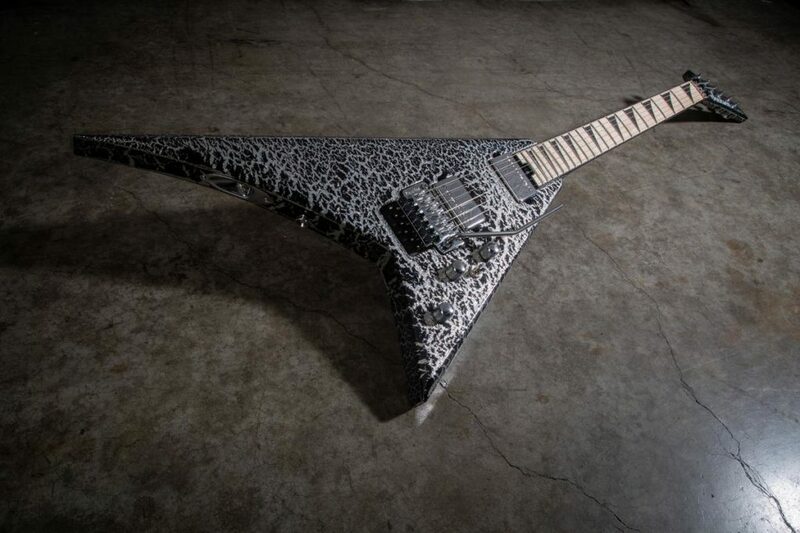 An iconic shape made famous by the legendary Randy Rhoads erupts here with this volcanic paint job by Travis Shannon. This RR model also boasts an alder body, quartersawn through-maple neck, maple fingerboard with black sharkfin inlays and 22 jumbo frets, EVH Wolfgang pickups, Floyd Rose Original trem system and nickel hardware. 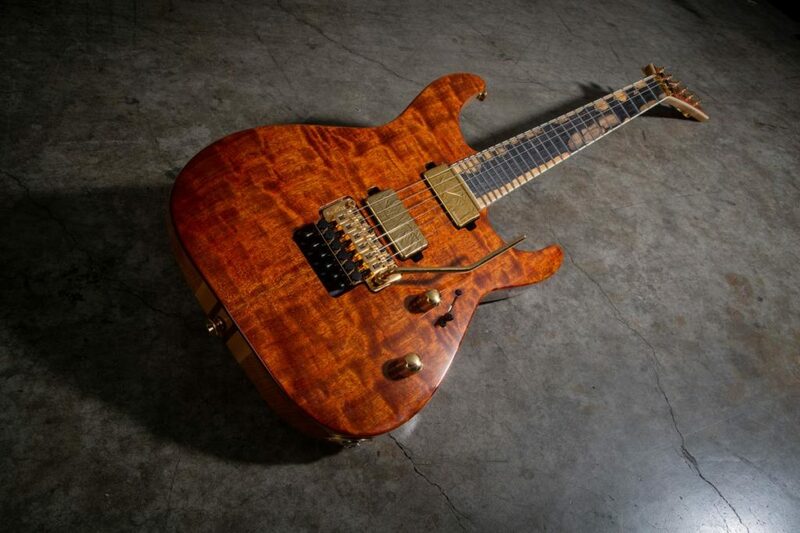 This Arch Top 27-Fret Soloist by Master Builder Joe Williams is absolutely brilliant. Featuring a ¾” soft-leaf maple top over the alder body, this axe has been decked out in an iridescent flip-flop finish that morphs from blue to violet to red and all shades in between depending on the angle and light. Atop a quartersawn maple through-neck sits a 12”-16” compound radius ebony fingerboard with 27 jumbo frets for higher note access. 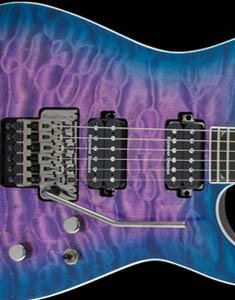 DiMarzio pickups, Floyd Rose Original trem system and black nickel hardware also get added to the mix for a show-stopping axe. 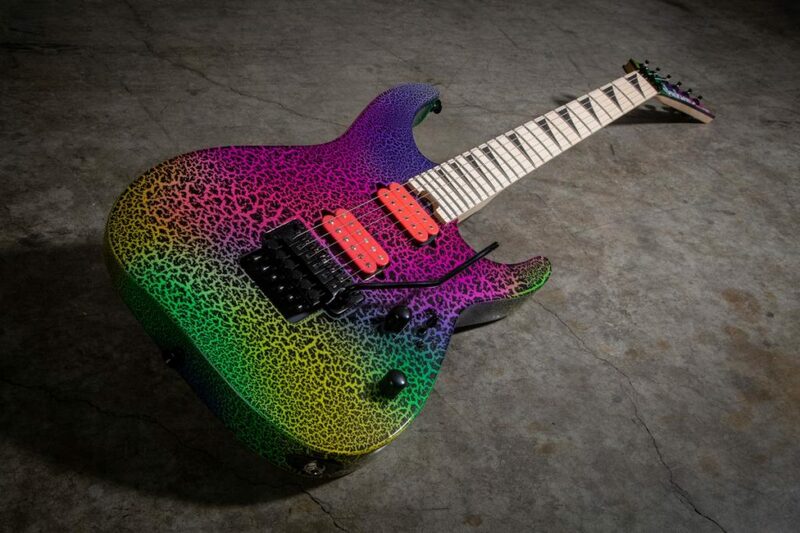 The various wood grains of the behemoth 7-string Jackson Dinky Pale Moon takes style to a whole new level. This gorgeous hardtail features a cooked ash body with an exquisite poplar burl top in a Natural finish, bolt-on caramelized maple neck and a splendid marbled pale moon ebony fingerboard. DiMarzio pickups, 24 jumbo frets, heel-mount truss rod adjustment wheel, black hardware and a matching AT-1 3×4 headstock complete this stunning creation. There’s a new monster in town. 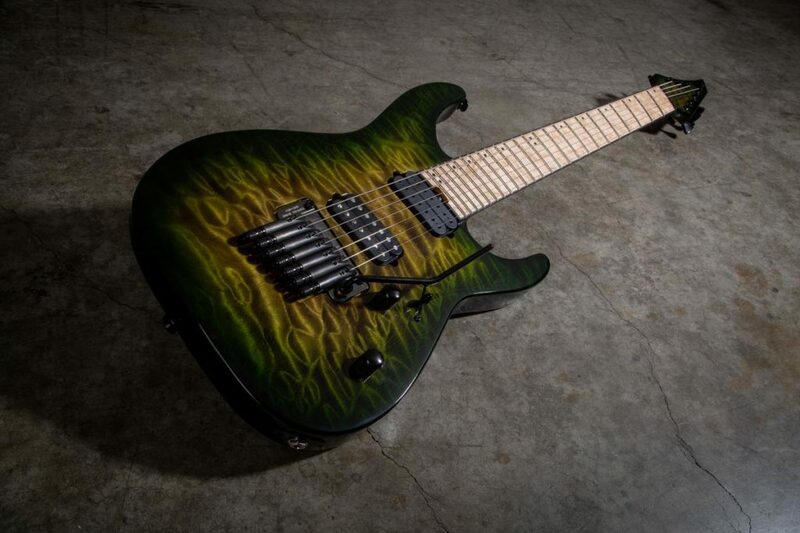 The Jackson Soloist™ MS Zilla Burst is a leviathan built for destruction! 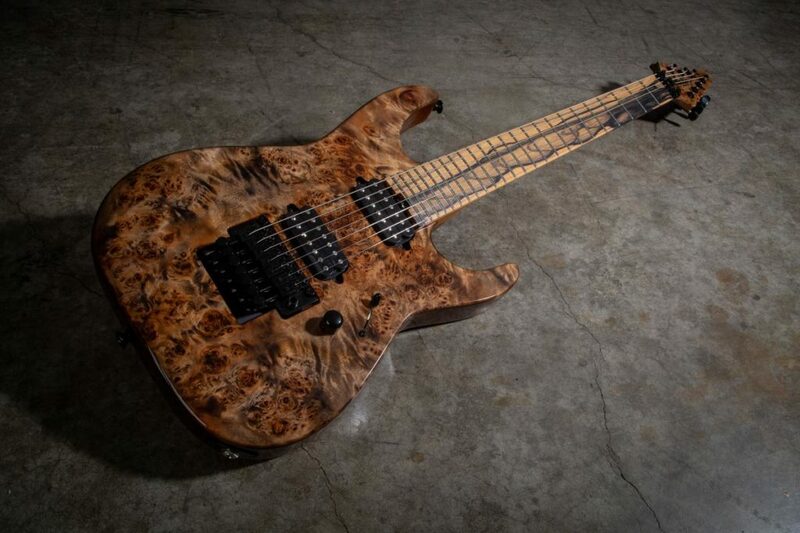 This multi-scale 7-string instrument features an ash body topped with quilt maple, quartersawn through-body maple neck and birdseye maple fingerboard with jumbo stainless steel frets. 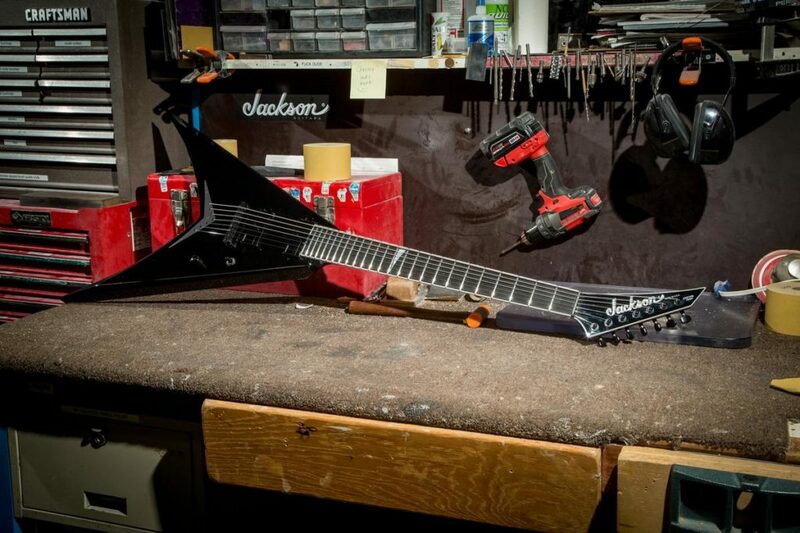 Double humbucking DiMarzio DP755 pickups were custom installed at an angle by Jackson Master Builder Joe Williams and designed specifically for lower tunings. Williams also got his hands on a new prototype Sophia Tremolo bridge for this bad boy. The yellowish to olive green to black Zilla Burst finish is featured on the AT-1 3×4 headstock as well, and capped off with ebony binding and black hardware. Pat McGarry and Mike Shannon teamed up for this extraordinary and regal Korina Roundhorn V in a Natural finish. The black korina neck and body emits resonance in spades, while the ebony fingerboard adds bright snappy tones. Ivoroid neck and headstock binding plus gold covers on the Seymour Duncan pickups, gold Jackson headstock logo and all-gold hardware including the TonePros Tune-O-Matic bridge give this modern marvel the royal touch. 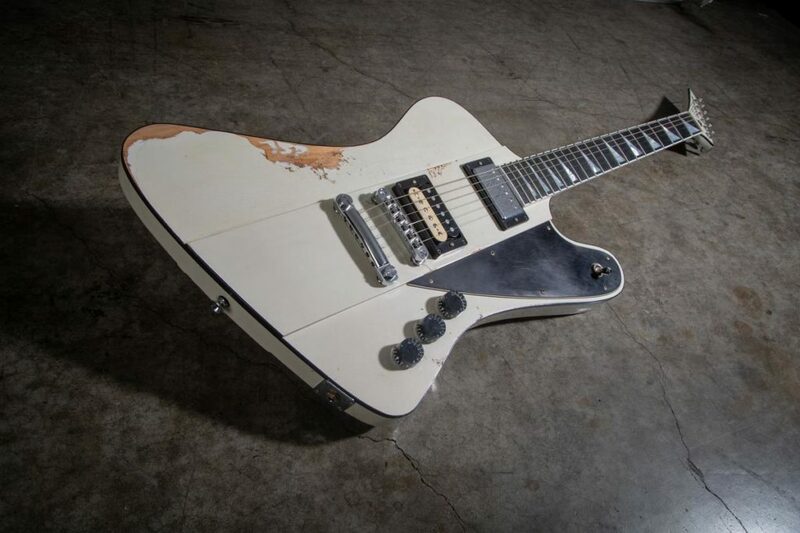 We can’t get enough of these F-Birds coming out of the Jackson custom shop, and this particular Mike Shannon Ivory creation was a NAMM showstopper. This fine bird features a mahogany body, ebony fingerboard with 22 frets, reverse pointed headstock with a hand painted Jackson script logo, Seymour Duncan® SH-1N ‘59 bridge pickup topped with a chrome plate, Seymour Duncan® SH-4B neck pickup with zebra bobbins. and TonePros Tune-O-Matic bridge. A heavy relic job exposes the raw wood around where the playing arm would rest, while the black pickguard, black binding, black speed knobs and black hardware add some extra attitude. 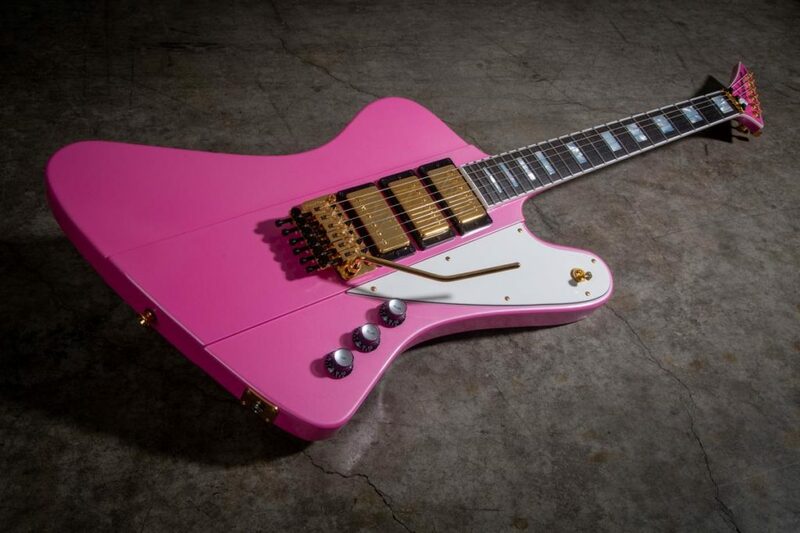 Mike Shannon and Jackson Custom Builder Pat McGarry joined forces to create this F-Bird and well, there’s no shot in hell of being overlooked when you combine this killer offset shape with a shocking Platinum Pink color. 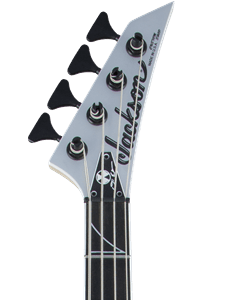 A matching reverse headstock with scripted Jackson logo, white pickguard, gold hardware and black skirt numbered knobs with pearloid in the middle. Other features of this eccentric axe include an alder body, ebony fingerboard, triple Seymour Duncan pickups with gold covers, Floyd Rose Original trem system and Gotoh tuners. Joe Willliams and Pat McGarry teamed up to deliver this mammoth blacked out 7-string custom Double Rhoads with a reverse pointed headstock. This sinister 27″ scale axe also features a quartersawn maple neck, ebony fingerboard with 24 frets and a single pearloid sharkfin inlay, Fishman Fluence Modern pickups and a TonePros Tune-O-Matic bridge and black hardware. Turn a page back to all the neon goodness you loved about the ’80s with this custom Dinky, painted by Travis Shannon. The black crackle finish is like a leopard tackled and rolled in a rainbow of green, yellow, purple and pink. 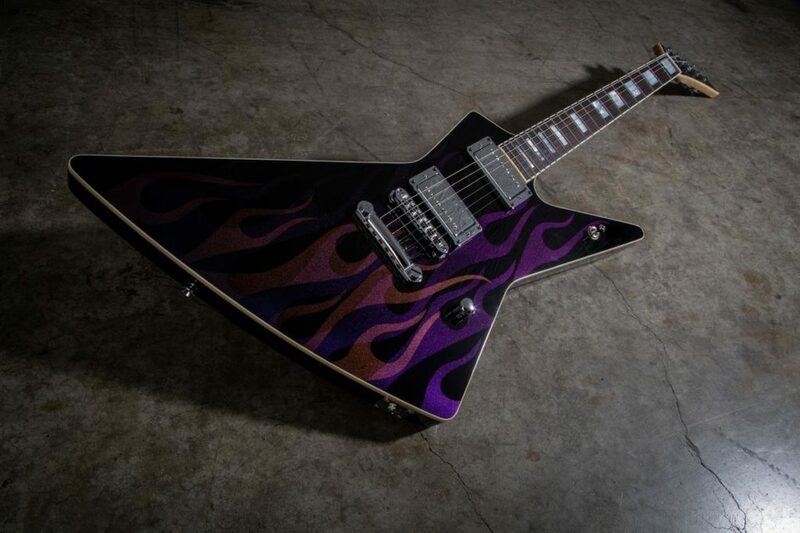 A matching headstock, maple fingerboard with black sharkfin inlays and screaming neon pink bobbins on the DiMarzio® The Tone Zone® humbucking bridge and DiMarzio LiquiFire™ humbucking neck pickups add to the intensity and vibrance of this screaming axe. An axe that plays so heavy, it lost its head. Master built by Joe Williams, this headless caramelized flame maple neck with ebony fingerboard is set into a cooked ash body. The buckeye burl top has been pigmented to bring out the phenomenal grain pattern, making this custom axe a wicked sight to behold. Seymour Duncan pickups, Sophia trem bridge and black hardware complete the package. Nothing rocks harder than diamonds. Travis Shannon painted the intricate Silver, Gold and Black Diamond pattern on this custom Soloist, which features an alder body, maple through-neck, ebony fingerboard with pearloid sharkin inlays and matching diamond headstock. DiMarzio® Super Distortion® pickups and a recessed Floyd Rose® Original tremolo give this insane creation an extra hard punch. This Concert™ Bass rocks the low-end in old-school form. 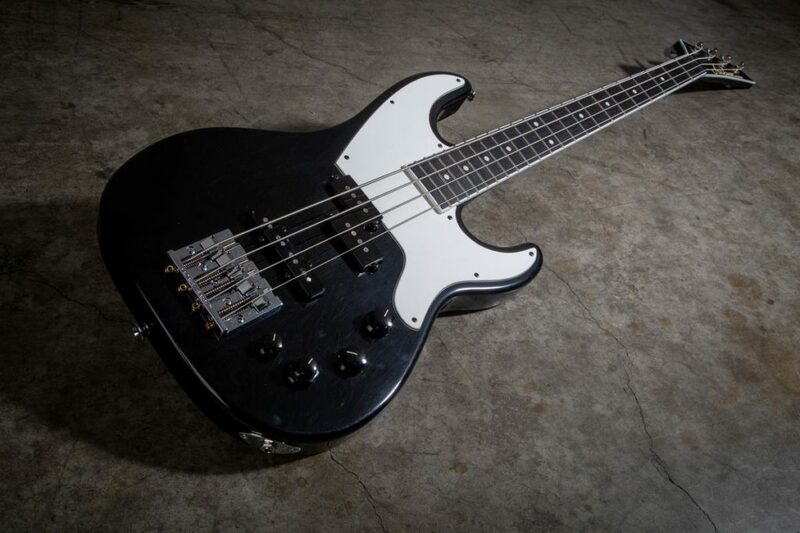 Featuring a relic’ed Black finish with white pickguard for a classic vibe, this four-string bass features an alder body, through-maple neck, ebony fingerboard with 21 jumbo frets and hand-painted headstock logo. A classic set of Fender P&J pickups provide the perfect blend of growl with phenomenal focus and clear high end, while the Badass IV bass bridge provides pristine note articulation and extended sustain. Magnificence! 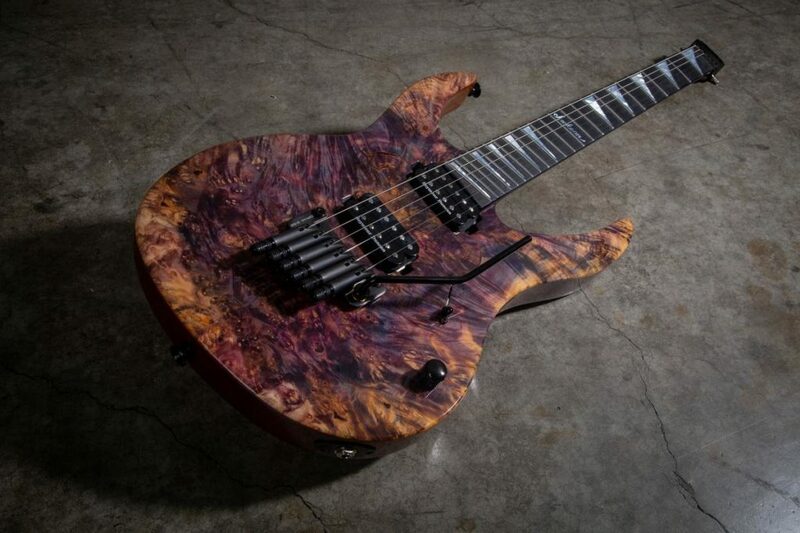 That’s the best way to sum up this custom Soloist in a Natural stain finish. Our Custom Shop wood specialist Pat McGarry went to town on his choices for this collaboration with Mike Shannon. A five-piece laminate neck features maple, walnut and flame maple, while the chambered 5A flame maple chambered body features a gorgeous figured mahogany top. Add in the exquisite marbled grain of the ebony fingerboard with black sharkfin inlays and and shimmering gold hardware and you’ve got the pinnacle of elegance. 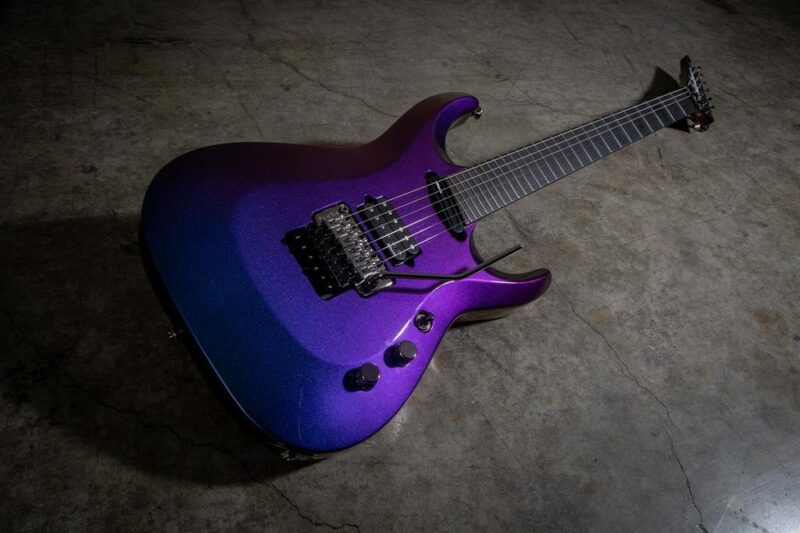 This beauty is also a beast though, with Fishman Fluence Modern humbucking pickups dishing out explosive power. Where Does David Ellefson Store His Grammy?